Rob is known for his inspiring and informative teaching style. He teaches at The Art League of Virginia and holds workshops throughout the U.S. and abroad. He regularly tours students through the great museums of Europe, garnering from his extensive knowledge of the old European masters and is a visiting instructor at The National Gallery of Art in Washington DC, demonstrating old masters’ techniques. 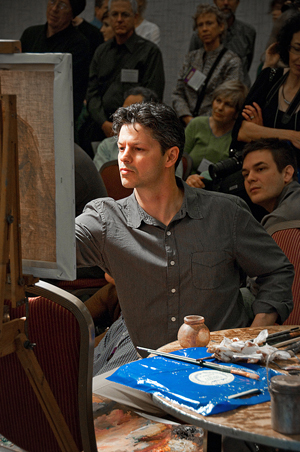 Rob also teaches and demos regularly for The American Portrait Society. For American Artist Magazine, he was asked to pioneer one of their first online teaching courses and taught regularly at their “Weekend with the Masters” workshops. Responding to the growing need for classical art instruction on those unable to travel, Liberace Studio has produced a series of tutorial dvds in which Rob demonstrates his techniques focusing on figure, portrait and anatomy. He has written articles on technique for both American Artist and The Artist’s magazines. If you are interested in hosting a workshop, please contact Rob or Lina. See Rob’s workshop information and fees here. This class will explore both the organized and elegant manner of classical drawing and the dynamic, fresh approach of contemporary alla prima painting. Though each style has a distinctive character, together they provide the artist with a more complete understanding of artistic technique. The first part of the class will focus on drawing methods with an emphasis on form and light. The final days will concentrate on the spirited technique of alla prima, (“wet into wet” application of paint) which will center on color and paint dynamics. Demonstrations will be given each day which will illustrate each approach. For information and registration call Kathy at 616-897-7842 or see the Franciscan Life Process Center website. This two-week class takes place in gorgeous and historic Bruges, “The Venice of the North” and will explore both classic method of figure drawing and the modern manner of alla prima oil painting with an emphasis on modeling and finish. The first week will be devoted to red chalk and silverpoint drawing using modern drawing tools and focusing on anatomical precision. The complexities of drawing technique including hatching and sculptural modeling will be highlighted. The final week will focus on the alla prima painting approach which will allow students to compose a figure painting with the look and finish of classic Renaissance paintings. Though alla prima (the direct manner of finishing a painting while it is wet) is often considered an impressionistic approach, it is also ideal for the careful and thorough modeling which is a hallmark of classical painting. This approach will allow students to thoroughly and efficiently complete a painting without the time consuming classic approach of glazed layers. Methods of drawing, paint manipulation, and color arrangement will be included and a thorough analysis of the anatomy will be stressed. See http://www.flemishclassicalatelier.com. The 19th century Pre-Raphaelites were inspired to create unusually modern works by studying the forgotten traditions of early Renaissance art. Students in this workshop will explore the materials, methods and the distinctive aesthetic of artists such as Rossetti, Millais and Holman Hunt. Popular narratives in this genre of painting will be recreated by the models as they dress in costumes evoking Shakespeare and the Arthurian legends. Techniques such as silverpoint, tempera, and oils will be examined and demonstrated during the course of the week. Model fees are extra. See The Art League website for info. Explore the great Spanish artist Joaquin Sorolla and his unique and dynamic approach to painting. Students look at and practice Sorolla’s special manner of paint handling and color approach. Using bold modern colors, students learn the different characteristics of his highly chromatic palette. This workshop includes the study of the costumed portrait and features discussions on anatomy and painting fabric. For more information contact Barbara or the Art Establishment at 610.807.9201. FRIDAY CLASSES AT THE ART LEAGUE – see link for The Art League in the top bar.